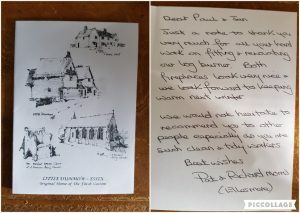 Stephens Chimney Sweep Feed back from a recent Stove refurbish and install. Summer is a good time to organise your delivery of firewood for Autumn and winter. 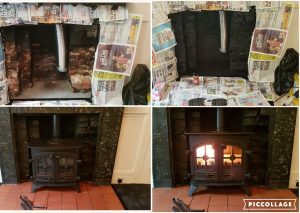 Only untreated wood of 20% moisture content or less should be burnt, by doing this you will get more heat from your logs as the energy wont go into burning off the excess moisture, it will prevent dangerous tar and creosote build up in your chimney and is also better for the environment. 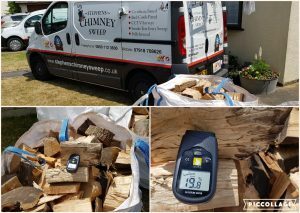 We had a delivery today, and as you can see by the moisture meter reading the logs where well seasoned before delivery. Stephens Chimney Sweep recommend Martin Ball Firewood they are Defra accredited suppliers of Firewood. They supply smaller net bags of logs to very large jumbo sacks and do a delivery service. 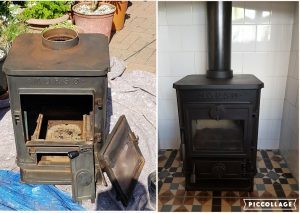 Stephens Chimney Sweep can fully refurbish your stove and reinstall to building regulations as set in document J.
new fire proof door rope and new fire bricks all fitted. We installed a new CO alarm plus data plate and registered install with Hetas. 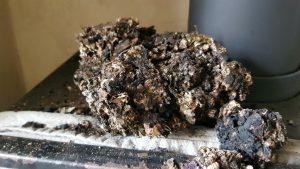 Stephens Chimney Sweep removed this clump of bird droppings from a blocked liner of a stove installation, fortunately the customer had a CO alarm Fitted. 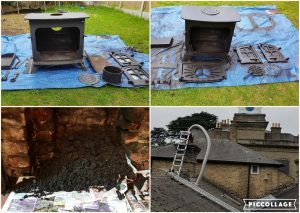 All stove installations must be fitted with a bird guard and have a CO alarm fitted at time of installation, If you don’t have a CO alarm Stephens Chimney Sweep will install you an alarm at £15 cost price when you book us for a sweep.